Sunroom kits offer a less-expensive alternative to custom-built sunrooms and enclosed porches. They come with all the necessary parts needed to build your sunroom right onto your home yourself. While this can be a great way for some homeowners to save money, putting together these kits is truly for the experienced DIY-homeowner. There are numerous types of sunroom kits on the market. Some build a custom solution for your home based on specific measurements and photographs while others have more generic, modular units. All of them will require you to have at least some experience working on home repairs or renovations in the past, although some are more forgiving and offer more support than others. A building permit: Your town may require you to pull a building permit before you begin building your new kit. Check with your town or city hall before ordering. You should be familiar with using and handling these tools. You should also have the physical strength or capability to lift and hold the walls and other items in place. Count on the construction taking at least two days and requiring at least one assistant. Every sunroom kit is different, but the basic order of assembly doesn't change much from site to site. To get the most sunlight in the room, place sunroom 15 degrees of solar south. This is different from reading south on a compass; to find solar south, or "true south" in your area, contact a local solar energy company or builder. For the most natural warmth in the winter, choose sunroom windows with a low U-value. These windows are more energy efficient and better at conducting heat from the sun. Before you order your kit, take a few basic measurements to size the kit you need. If you are having a kit custom built to your house, follow the manufacturer's measuring instructions. Stand with your back against the house on the deck or foundation the sunroom kit will be installed on. Measure from this point out to the end of the deck or foundation. This is the sunroom's width. Measure across the front of your deck or foundation where you want the sunroom to be installed. This is the sunroom's length. Measure from the deck or foundation up the side of your house as far as you can before reaching the gutters or eaves. This is the height. Before you begin, make sure your foundation or deck is level and built to the specifications of the kit's manufacturer. Pull any permits you require and make sure you have all the necessary tools on hand. If your sunroom will be opening up to another room fully, rather than through an exterior door, make sure you check to ensure this wall is not load-bearing before removing it to open up the room to the sunroom. Install the foundation supports, laying them out onto the deck or foundation and screwing them down into place. The walls will connect to the supports to create a watertight foundation. Install two-by-fours if necessary to the exterior of your home to attach the sunroom kit. Install the two side wall frames, screwing them to the exterior of your home and to the foundation supports. Install the front wall frame, if included, screwing it to the foundation support and the two side wall frames. Install the roof trusses, attaching them to the exterior of the house and the foundation support at the front of the kit, or to the top of the front wall frame. Install the roof glazing, one panel at a time, beginning at one side of the sunroom and moving across from side to side. Install the walls or window walls of the kit, either glazing, or lumber and windows. Hang the doors leading to the exterior of the sunroom. Finish the interior if necessary. Sunroom kits run the gamut from modular and fairly easy to put together to completely custom and requiring some knowledge of carpentry to erect. Double check all the specifications from the manufacturer before you order to make sure you get the product you are expecting. If you are looking for a three-season modular sunroom that is fairly easy to put together, consider SunPorch. These fairly easy-to-assemble sunroom and sun porch kits come in three standard sizes. Measure your foundation and find the kit that fits comfortably in that size. All of the pieces are premeasured, cut and drilled; all you have to do is assemble them. The frames are made of metal, and all of the wall panels can be changed out to screens, converting your sunroom to a sun porch in just a few minutes. Patio Enclosures' sunroom kits are for the more experienced DIY homeowner. Many of the pieces must be measured and cut to fit on site, which makes the job a little more challenging. Their finished product has a full roof, rather than glazing, which gives it a more finished, custom look. You have your choice of a gable, or single-pitched roof, single or double-paned glass, four different sizes and two colors. The doors are sliding, to help incorporate additional airflow into the sunroom, and through the sunroom into the rest of your home. If you want the look and feel of a custom-built sunroom with the convenience and pricing of a kit, look to North Country Creative Structures. Their beautiful sunroom kits are built to fit your home; all you have to do is assemble it once it arrives. Their products are made with real hardwood, and include several styles of trusses including Tudor, Natural and Gable arches. 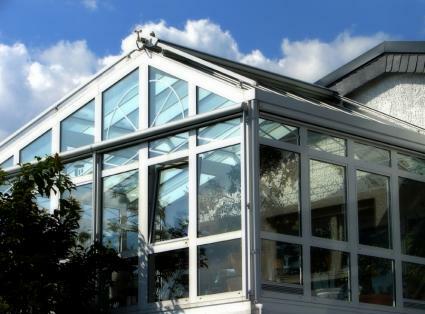 The sunrooms are designed to capture the warmth from the sun and transmit it to the rest of your home, helping your home become more energy efficient. DIYSunroomKits.com is a custom option at modular pricing. All of their kits are built to your specific dimensions, so you don't need any filler panels or to cut the pieces to fit once they arrive. Their pricing is some of the lowest in the industry for four-season sunrooms and all of their products are made to interlock to one another without screws or fasteners, which can make it easier for homeowners to install themselves. A new sunroom can be a great commodity that can help you make even greater use of the space you currently have. If you are considering a new sunroom, make sure to consider building from a kit. With the many options available, no one will ever know you did it yourself.